Home / News / Thank You for Supporting MI Guitar + Now Collecting Pre-Orders! Thank You for Supporting MI Guitar + Now Collecting Pre-Orders! On behalf of the Magic Instruments Team, thank you to all who contributed to the campaign and helped to make it a success! We are now returning focus on making the MI Guitar as amazing as it can be. We will also continue to take pre-orders on our website as we transition to a post-campaign status. 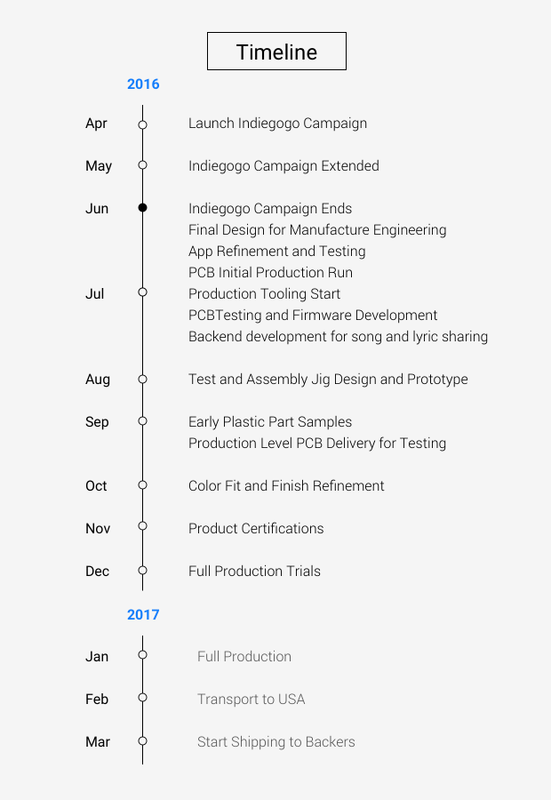 We will also be sending monthly updates of our progress through Indiegogo updates and social media channels. Please follow us on Facebook and Twitter. Featured in more than 40 press articles including WIRED, CNET, Techcrunch, Engadget, and Fast Company. Bet 50 people a jar of jam that they they could jam on the MI Guitar in San Francisco. We will send you an email message before the start of our MI Guitars’ production to ask your color selection. As always, if you have questions that can not be answered by our FAQ, please feel free to reach out to us at support@magicinstruments.com. This is just the beginning, thank you for joining us in our mission to allow anyone to be musically expressive with the MI Guitar. We can’t wait to show you what’s next!